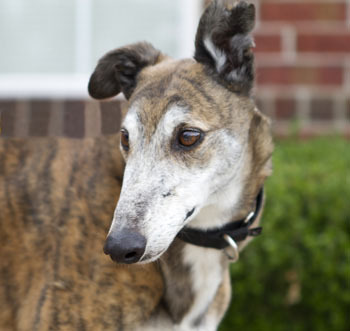 Stetson is a 9-year-old brindle male born in April 2004. He arrived with Cupcake as an owner surrender to a shelter. 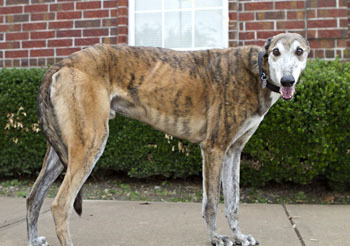 GALT eventually received 10 greyhounds from this same owner, the other eight being Carbon, Charity, Clooney, Onyx, Harry, Blade, Stewart, and Timex. Unfortunately, Stetson, like the other nine, arrived heartworm positive, and with a heavy load of intestinal parasites. But Stetson's long, 7-month journey back to health is now complete! Stetson is tattooed; however, because his ears are so dark and black on the interior, the tattoos are mostly illegible - the only ones readable are "4G", meaning he was born in 2004. He is in a foster home in the Austin area. He would do best in a home with no small children.